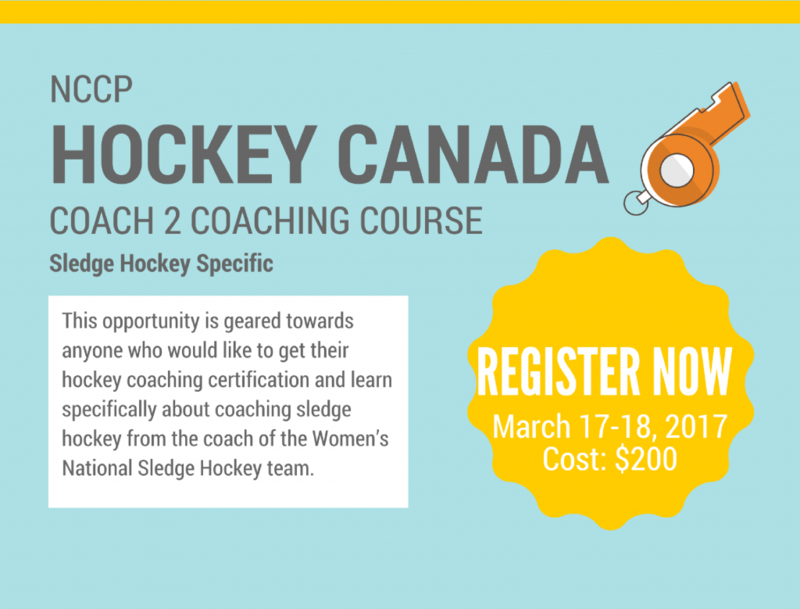 Coach Level 2 NCCP Hockey Canada Coaching Course that is specific to sledge hockey (Certifications will be effective Aug 31st 2017- starting next hockey season). This course is perfect for anyone 16+ years of age who is interested in coaching sledge hockey in the future or receiving NCCP Hockey Canada coaching certification. No previous sledge hockey experience required (all equipment provided). The course includes an online component (4-6 hours) which needs to be completed prior to the in-person component of the course. Course Facilitator: Tara Chisholm M.A. Head Coach of Canadian Women’s National Sledge Hockey Team, Wellness Programmer at Medicine Hat College, Head Facilitator of Medicine Hat Adaptive Sport and Recreation Program. Date and Time: Friday March 17th 2017. 12:00pm-8pm (combined on and off-ice session) with optional coaching opportunity Saturday March 18th 9-10 am with beginner athletes. Phone hotel to reserve your single or double rooms under the ‘Sledge Hockey’ Block before Feb 15th at 9am. Fees: Pay $30.45 for the online HU course + $145.95 for the in-person course (total =$176.40) when your register for the course online (see details below) which covers the Hockey Canada certifications. When you arrive for the in-person course on March 17th at noon, you will be asked to pay and additional $20.00 to cover food, ice time, equipment, and traveling of facilitators. Total cost: $196.40. What you need to bring: Long shirts and pants for on-ice section. 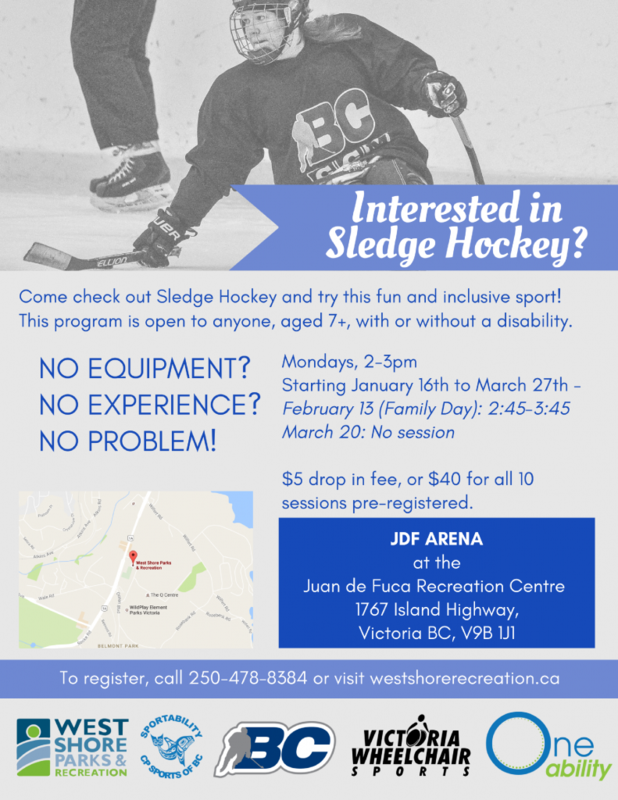 Bring your hockey equipment (if you have it) or we can provide equipment, sledges and sticks. 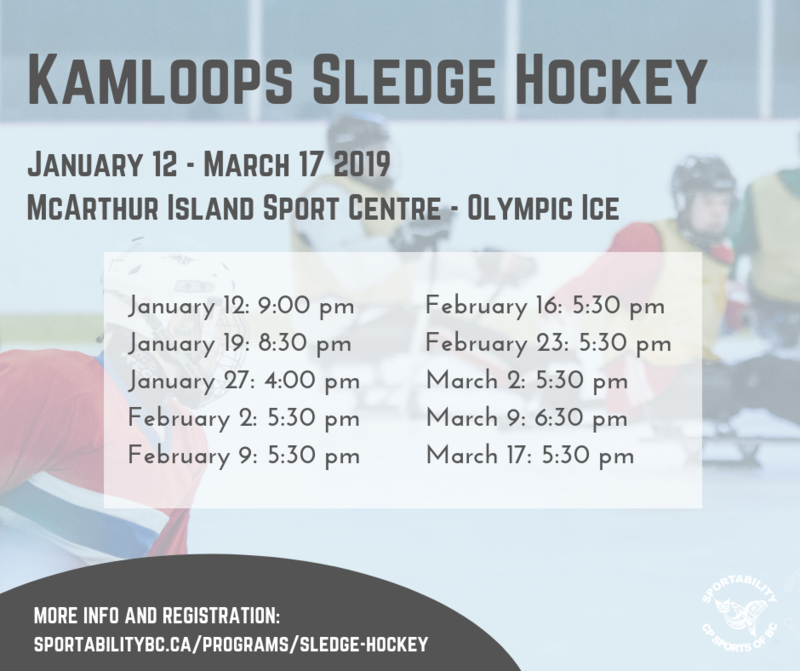 Open Development Camp: If you are coming for the course and are interested in attending the open sledge hockey development camp March 18th and 19th, please register here (all equipment provided). The deadline for registrations for the Development Camp is February 26th. Please refer questions to Peggy at sledgehockey@sportabilitybc.ca. Give us information about yourself and your intent to participate in course by clicking on this link. Visit the Hockey Canada link and sign in to your eHockey account. Search for your name to see if you have a previous username in the system. If you do not, you will be asked to 1) make an account, and 2) add yourself as a participant to your account by clicking on ‘add participants’. Note: If you are registered previously under another province (example Hockey Alberta instead of BC Hockey), please call BC Hockey at 250-652-4536—and they will walk you through how to transfer your online account to BC so you can register for the course. This will take a few business days so please do this ahead of time. Having a BC based username will allow you to access the online component of the course, register for the in-person part of the course, and get your certifications upon completion of the course. If you have not previously received a Hockey Canada ID, create a new member profile on the “Member Not Found” page. Once you get a username and have logged in, pay for the clinic with credit card. You will then see a link to complete the HU-ONLINE Coach ½ course. This is estimated to take 3-4 hours to complete. We request people complete this 1 week before the beginning of the in-person course. Show up to the in-person coaching session at noon on Friday March 17th, 2017. Upon completion of the course, your account will be updated to represent your new coaching certifications. This entry was posted in News & Announcements, Sledge Hockey. Bookmark the permalink.